Exercise 2 involved looking around for interesting surface textures and making marks to express these textures. I chose a glass vase, a piece of silver paper and finally a wooden sign. 1. 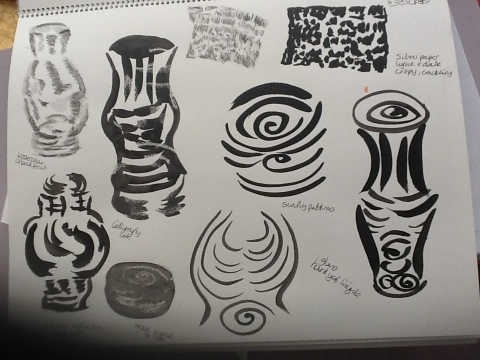 First of all, I looked at a glass vase which was catching the light and I thought this would be interesting. Words to describe the vase: hard, shiny, smooth, fragile. I wanted to capture the hard, shiny surface and make it look fragile at the same time. 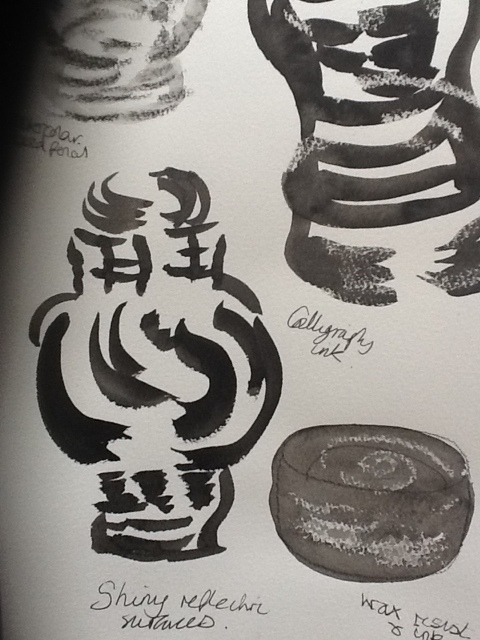 I made a number of studies in: watercolour pencil with water added afterwards; calligraphy ink; wax resist with ink. I found myself repeating swirly lines to capture the reflections but found the wax-resist techniques the most effective, in the same way as I used wax resist for water quality in earlier exercises. 2. 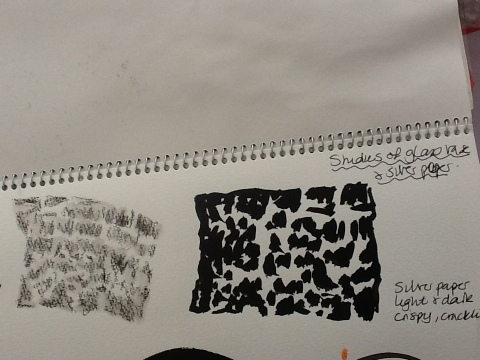 I then made a couple of studies of a piece of silver paper. Words to describe the paper: shiny, crackly, crumpled, crunchy, fragile, tinny, sharp edged. Again this was catching light but in a different way than the vase and I wanted to try some different techniques to catch the reflective quality of the paper. 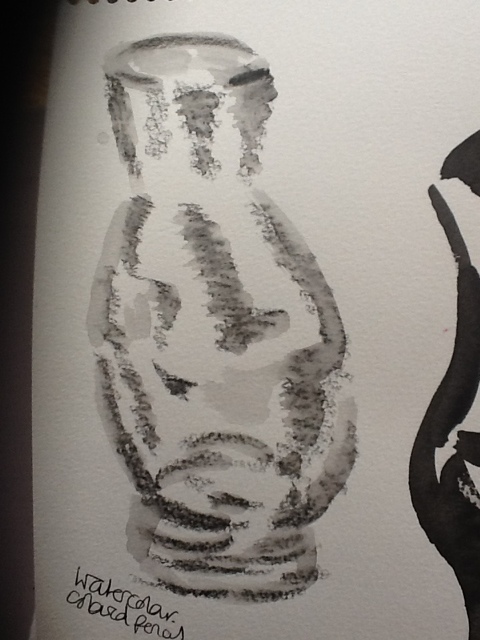 I daubed black calligraphy ink with the end of a stiff brush first and then tried again with black watercolour pencil, adding a little water to blend. I must say, I was not feeling very inspired and enjoyed the previous exercises with my photos much more. 3. Next, I chose an old Japanese shop sign. 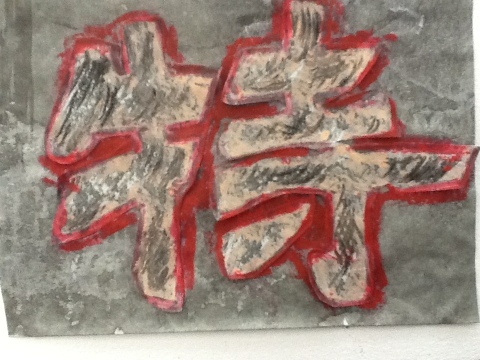 It was an interesting combination of calligraphy characters stuck onto painted wood. There was also an elephant logo. The whole thing was distressed with peeling paint and some characters missing which i think gave it a textural quality I wanted to capture. Words to describe the sign: flaky, peeling, patchy, crumbly, mottled, rough. I had previously used this sign to experiment with rubbing as the characters were raised enough to be able to make clear rubbings using wax crayons. 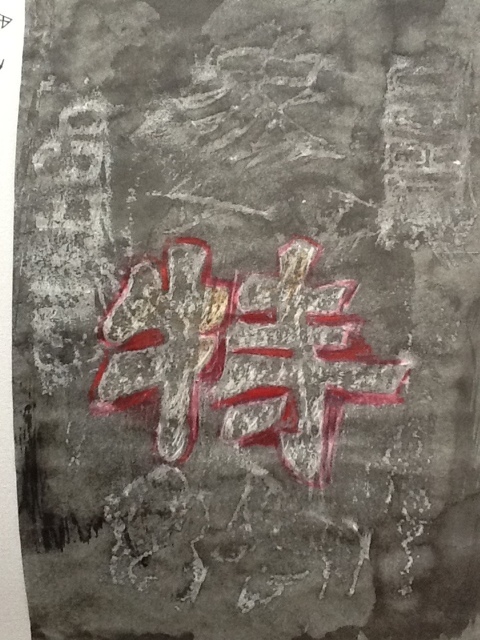 I then inked over the rubbings and outlined the calligraphy with red coloured pencil. 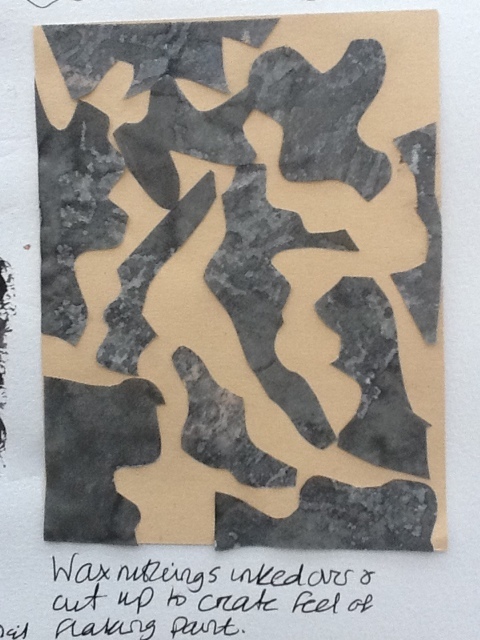 This time I decided to make more rubbings but then cut them out and stuck down on a piece of paper to which I had already applied an ink wash over wax. 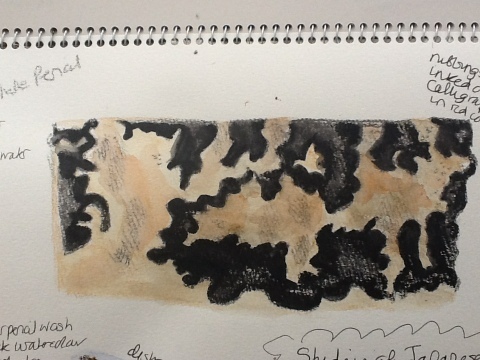 I then added black pencil to bring out the texture. I was pleased with the result as the wax resist provided a distressed feel and the raised letters emphasised the layering of materials on the sign. Next, I carried out study of a small area of the sign where paint had rubbed away. I used black watercolour pencils, dipped in water and was able to show the blending of colours fairly well. I then looked at another area of the sign and this time, applied a watercolour wash, then black watercolour pencil, onto wet paper. Graphite pencil was then used to add detail. 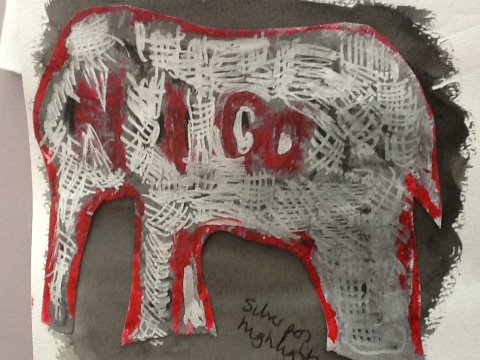 This worked well to indicate the distressed paint effect on the elephant logo. The last drawing was of the elephant logo. 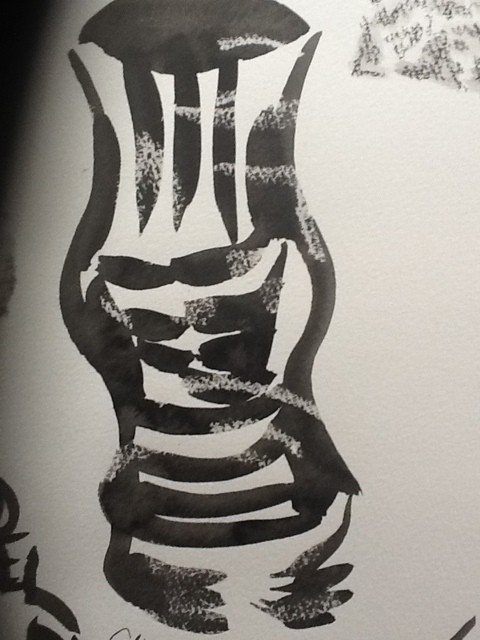 I traced the elephant shape and cut it out. 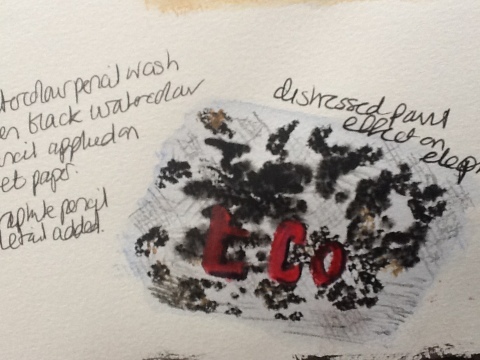 I then used red pastel and silver pen to show the patchy areas. This was not particularly successful and I would like to try again but use silver paint instead of the pen which was too scratchy. I had some pieces of inked wax rubbings and decided to cut them up in pieces to create a collage to represent the flaking paint on the sign. I thought this worked well and felt it was time to move onto the next project!